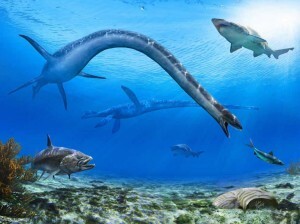 Although great swimming reptiles resemble the dinosaurs and are often discussed alongside them, they are not true dinosaurs (which are land-dwelling). Plesiosaurs grew to a size of 14 m (46 ft) and apparently used their flippers to “fly” through the water like a penguin. Although we have no absolute confirmation that plesiosaurs remain alive, enough evidence exists to suggest that some of these creatures (or similar sea monsters) still lurk in very deep lakes and in the sea!